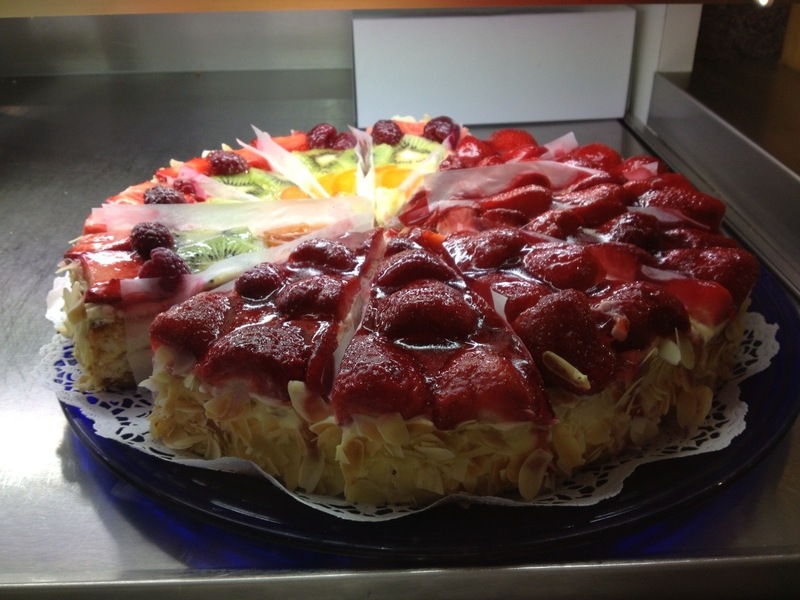 Saturday 1 June – Breakfast in Austria, Lunch in Germany, Dinner in Switzerland. 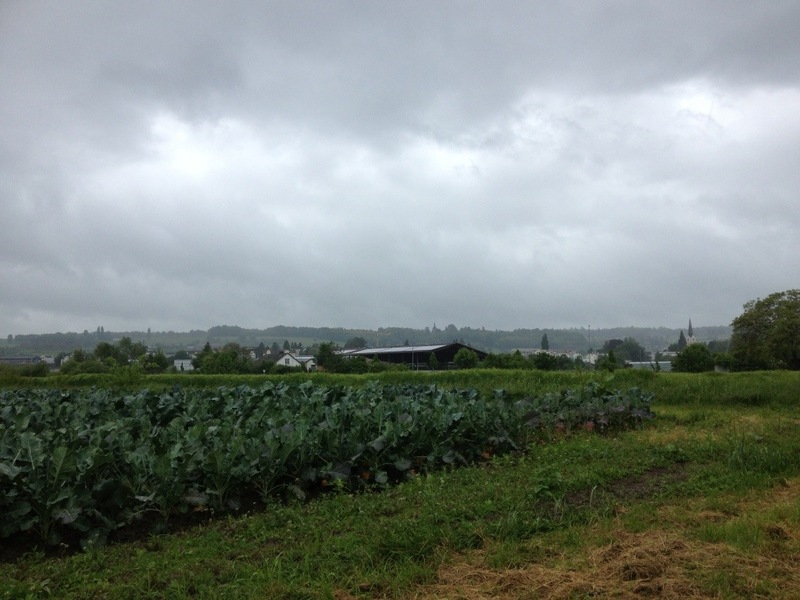 The forecast today was rain – loads of it! 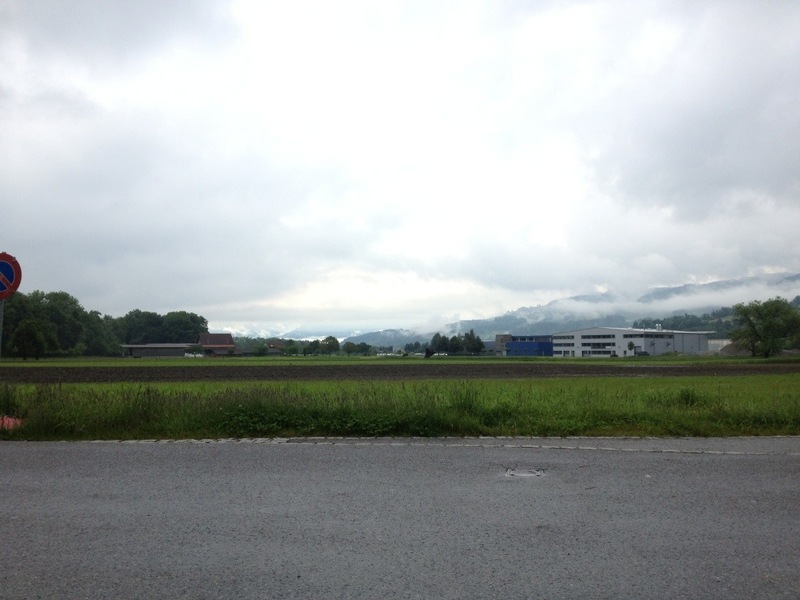 However, when I went down to breakfast it wasn’t raining, nor was it raining whilst I repacked my bags. It seemed like an exceptionally good idea for me to get underway before the heavens dropped their forecasted 29mm of rain. So I settled up the bill at the hotel, fetched Alfie from the garage and was on the road by 8:15am. That’s early! Here’s my route for today, starting at the bottom right. I decided today to wear a different arrangement of cycle clothing, knowing that rain was forecasted but that it was also going to be reasonably warm. I don’t like riding in waterproofs (boil in the bag) and if it’s warm you’re better off just getting wet and drying naturally. So I had shorts with legwarmers, two jerseys and armwarmers, and this was a very good temperature for the earlyt morning’s riding. I rode for more than an hour before I felt any rain. However, I could see lots of evidence of water in the skies – there were some lovely views! 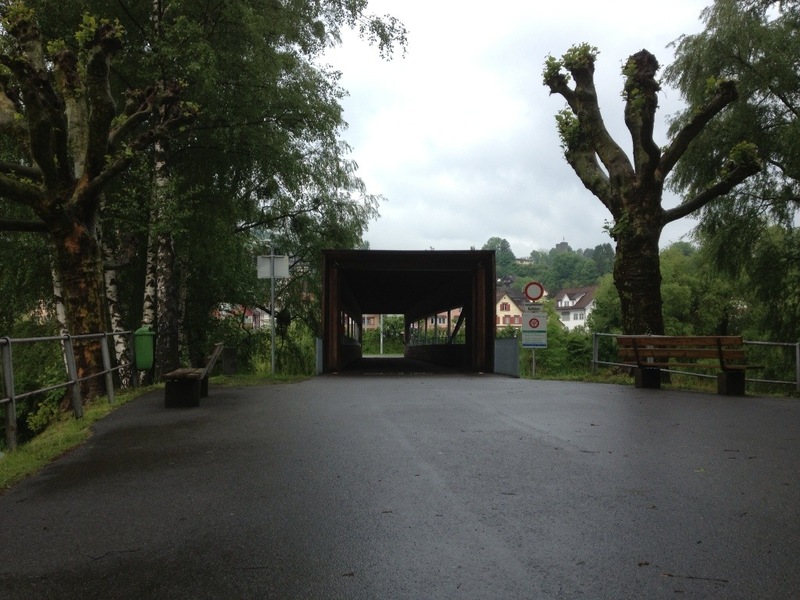 Höchst is the penultimate town in Austria; I rode through Gaißau and then arrived at this bridge. It’s the Rhein that he’s hovering over. 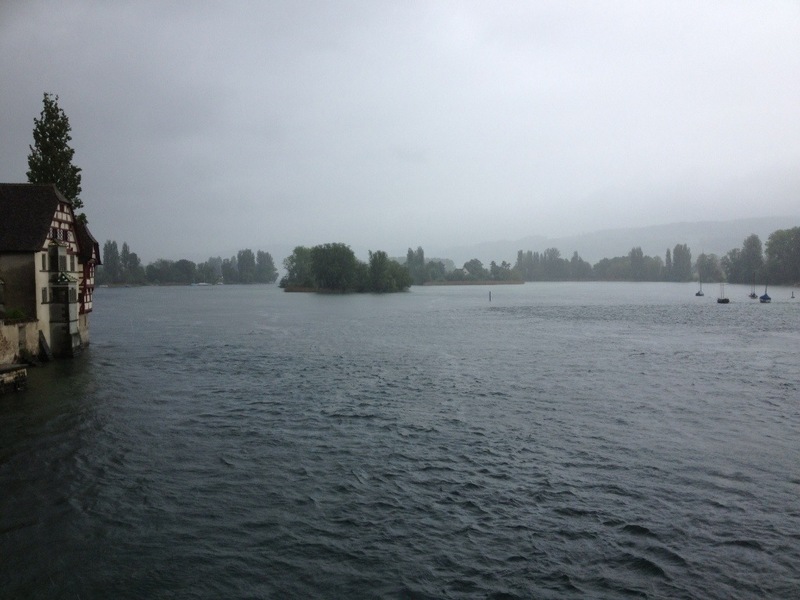 Readers of yesterday’s blog will know that I had already crossed the Rhein – turns out it splits into two at one point, like a mini delta, and I was now crossing the Alter Rhein. On the other side of the bridge was a whole new set of cycle route signs to familiarise myself with. 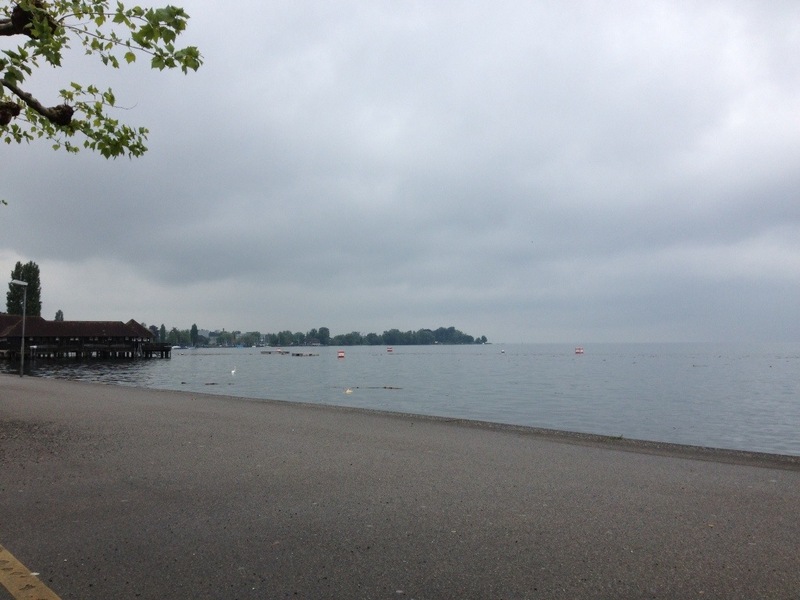 My destination for the day was Romanshorn (I’d looked up a few hotels there) but I did wonder, with the improved weather, whether I might get a bit further. Once I’d crossed the bridge I was on a non-tarmacked surface. It was OK but I kept hearing grinding noises as stones were flicked up into my rear mudguard. 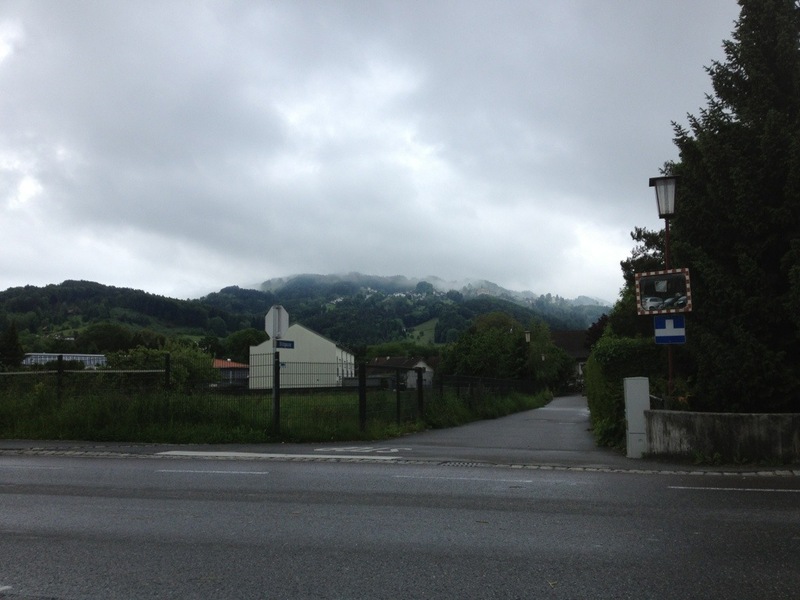 I rode through Rheineck, Altenrhein and Staad, really enjoying some of the views of clouds hovering over hillsides. 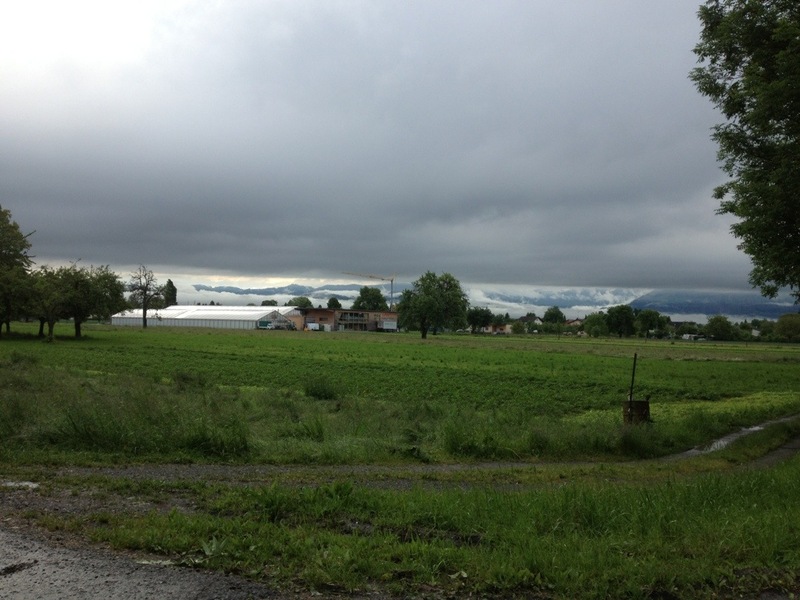 And clouds over Bodensee as well, of course! 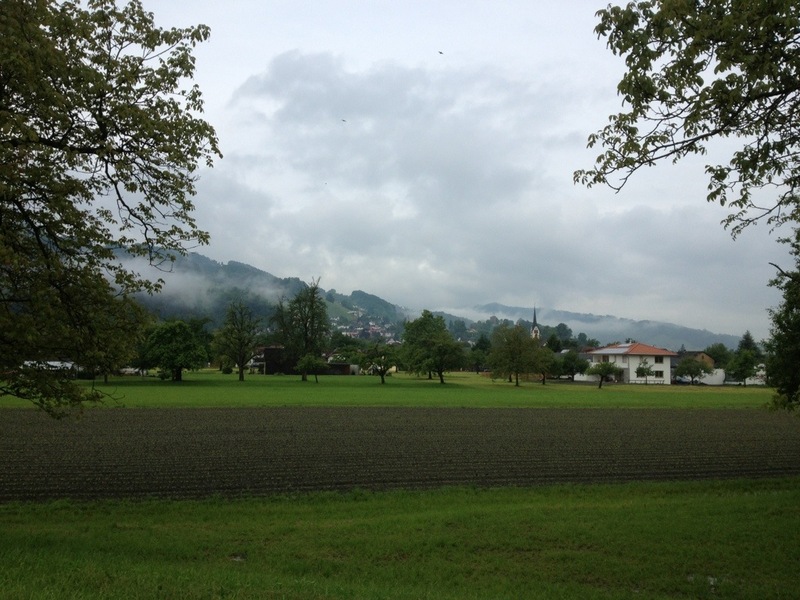 I chatted to a few people with dogs as I passed by – and discovered that it’s very difficult to understand the Swiss accent! As I approached Rorschach there were clouds of little flies hovering over the track and I had to periodically shut my eyes and mouth as I went through these clouds. This was looking across to Horn from Rorschach. 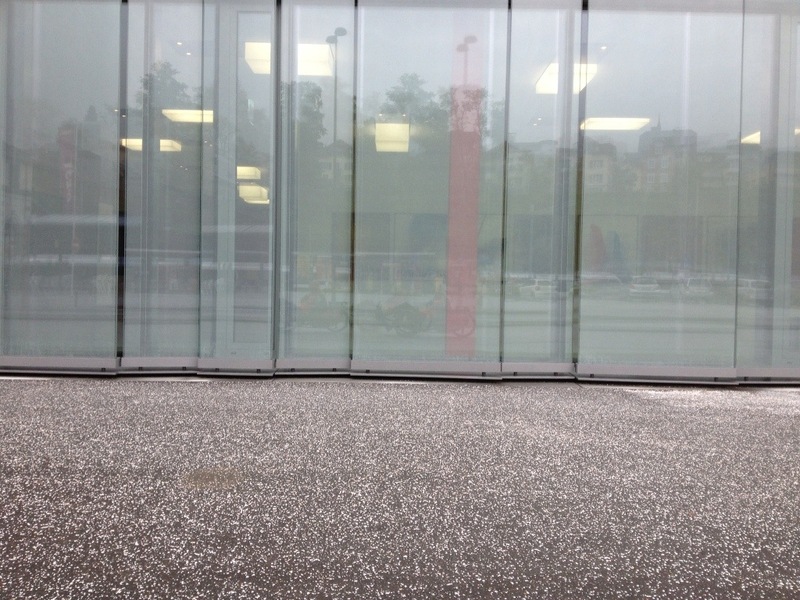 The first spots of rain were falling. Very quickly the rain turned to proper rain, the sort that will drench you within a minute. I took refuge under an overhang from a café. After about ten minutes the rain had eased off a bit from ‘pouring’ to ‘raining’ and I headed off again. 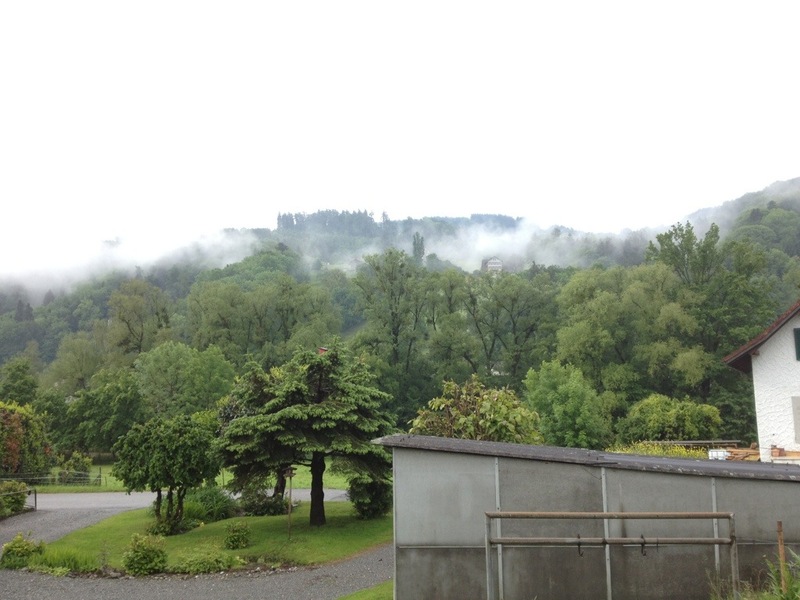 I took this picture looking across at Steinach – those clouds are looking more ominous! 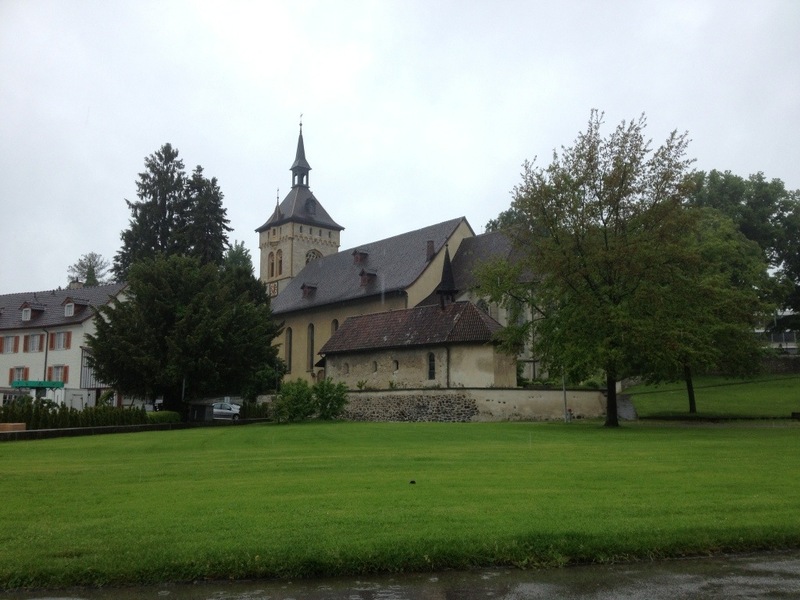 I approached Arbon, riding past this church that started ringing its bells for 10am. 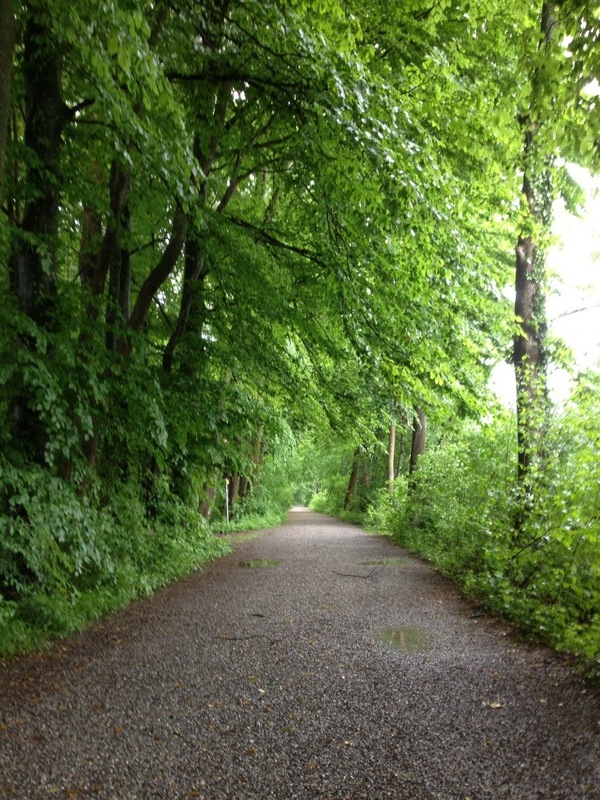 I had covered about fifteen miles by this point. 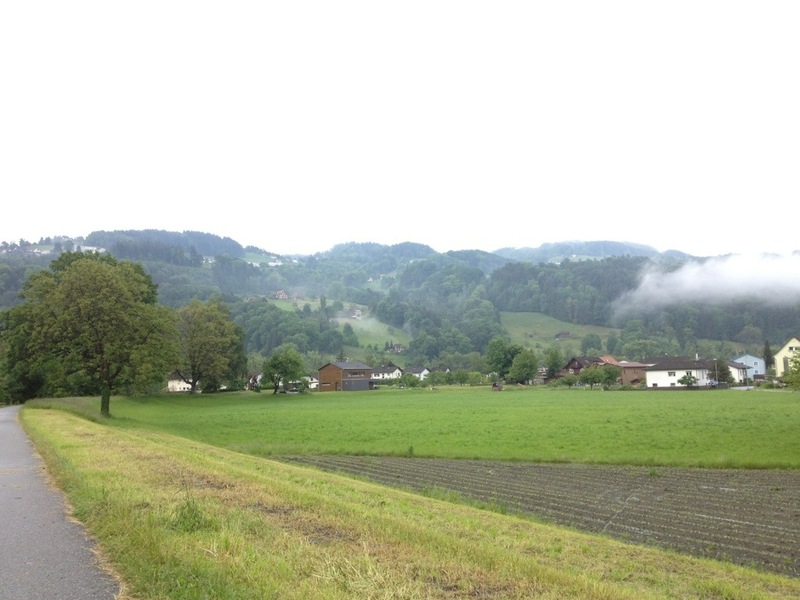 I passed several fields of sheep where the sheep were wearing cowbells (sheepbells?) 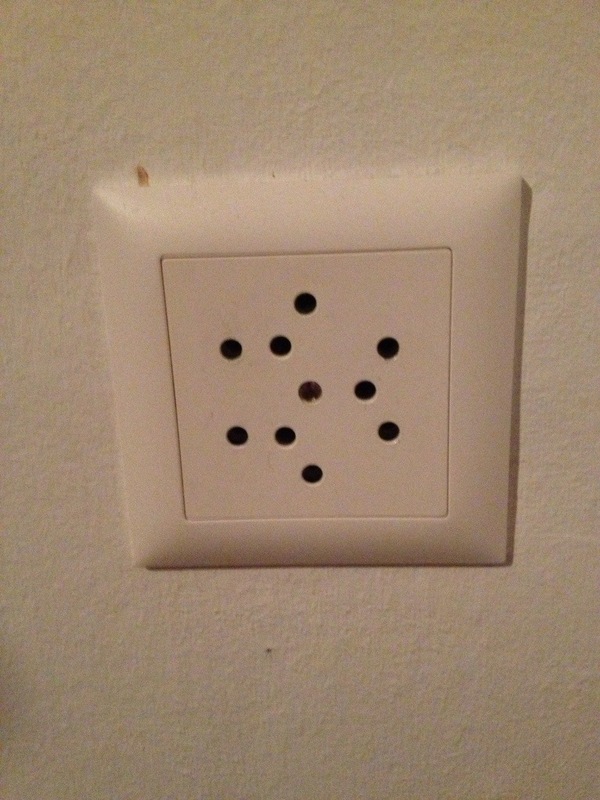 Not something I’ve noticed in Germany or Austria! 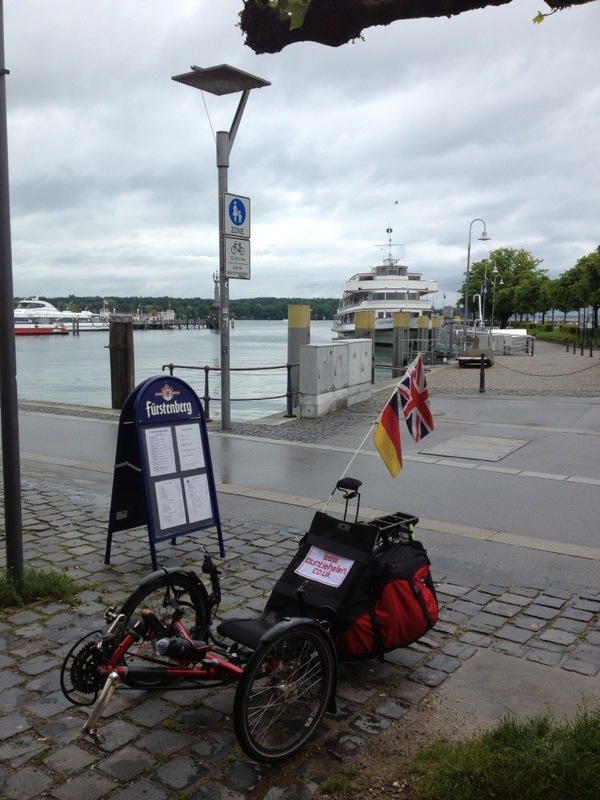 I rolled into Romanshorn at about half past ten. This was originally my planned overnight stop but clearly I had to recalculate a bit. Although it was raining and I was wet, I wasn’t uncomfortable with the clothing I was wearing so pressed on. Here’s a reminder what country I was in. After Rorschach the rain fell much harder. I saw a lot of people wearing huge macs that flapped about – this chap on the left was pushing his son along. 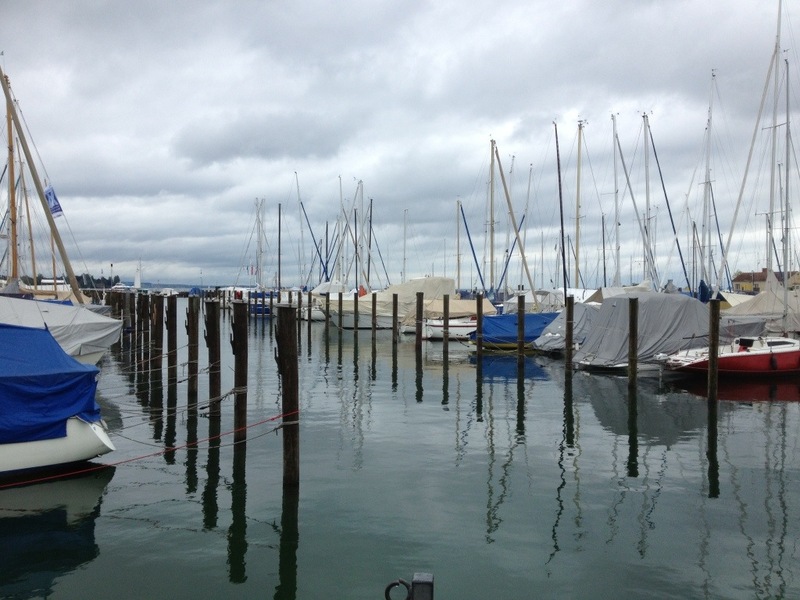 My plan B was to have lunch in Konstanz (at 32 miles) and see what I wanted to do after that. 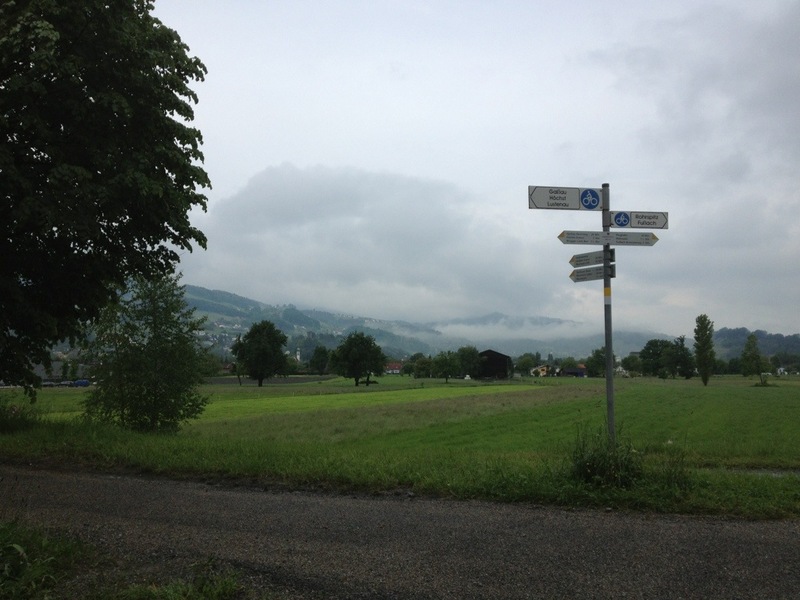 I thought it was now feasible to stick to my original schedule and ridde to Stein am Rhein and the friendly B&B, but I’d see how I felt when I stopped. 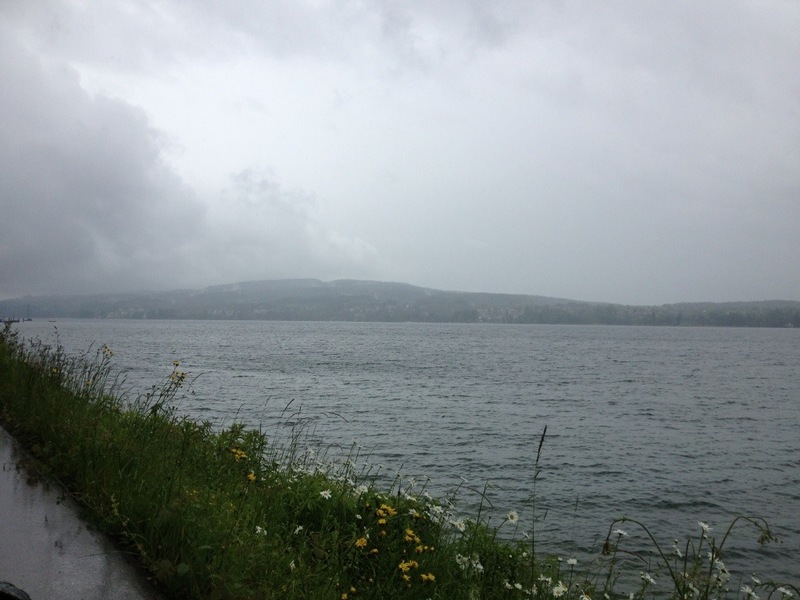 The final miles to Konstanz were a bit drier with just a faint drizzle. 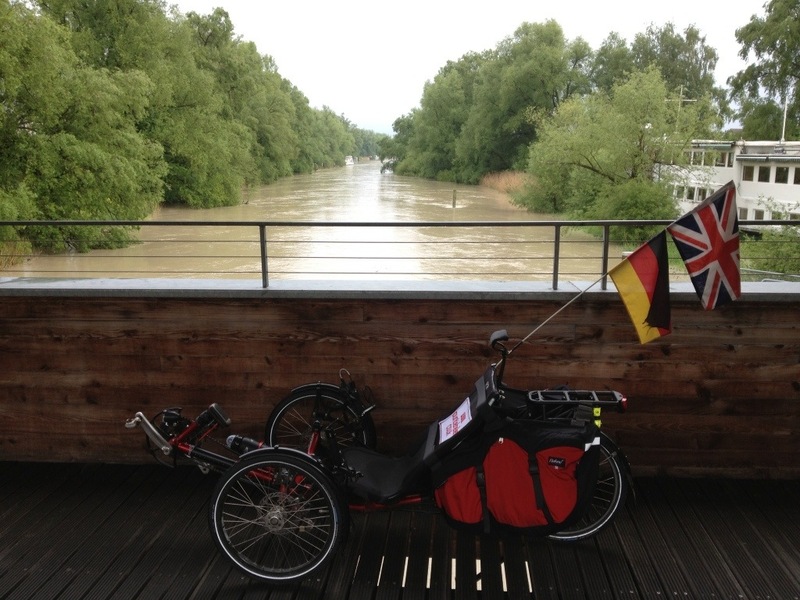 I was turning the pedals steadily and it was midday when I reached this point – the border into Germany! The route took me in past cars queuing for the customs area, and then along the harbour which is the other side of the railway line to where the hotel was I stayed at on Wednesday night. Here are some boats for James. Here is Alfie, parked up as I wanted to check out a café. I didn’t fancy the offerings though so headed off. 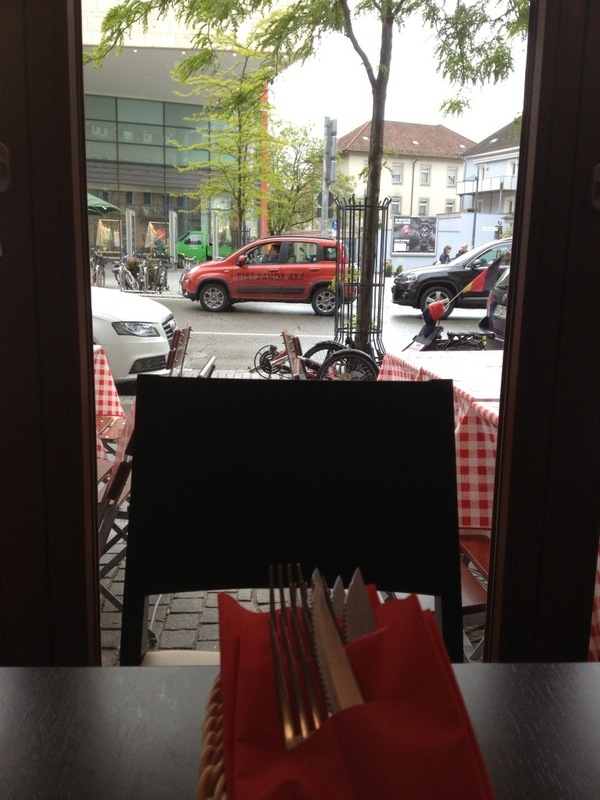 I rode round to the pedestrian area and parked Alfie outside an Italian restaurant. I went in and ordered some soup and a tea. The man said that he would have to charge me for the hot water – 3 Euros. I thought this was ridiculously steep for tea/water so said I’d have a glass of tap water then. 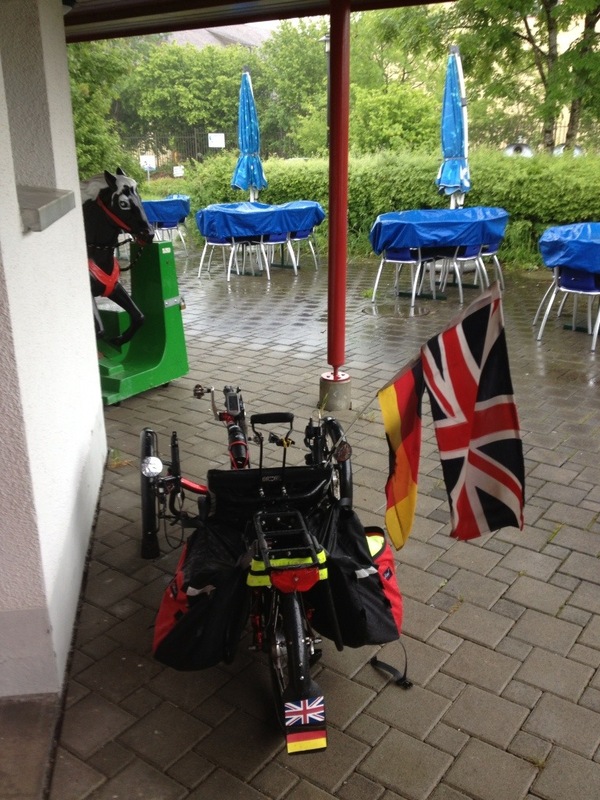 He said they didn’t supply tap water, only mineral water, and could I move my trike away from the seating area outside. I said I wanted to be able to see it from the window (which I could, just) as it is expensive. I told him to cancel my order and I went outside to find somewhere else – didn’t find them a very friendly café! Soon enough I found another Italian and they didn’t mind that Alfie was parked outside. 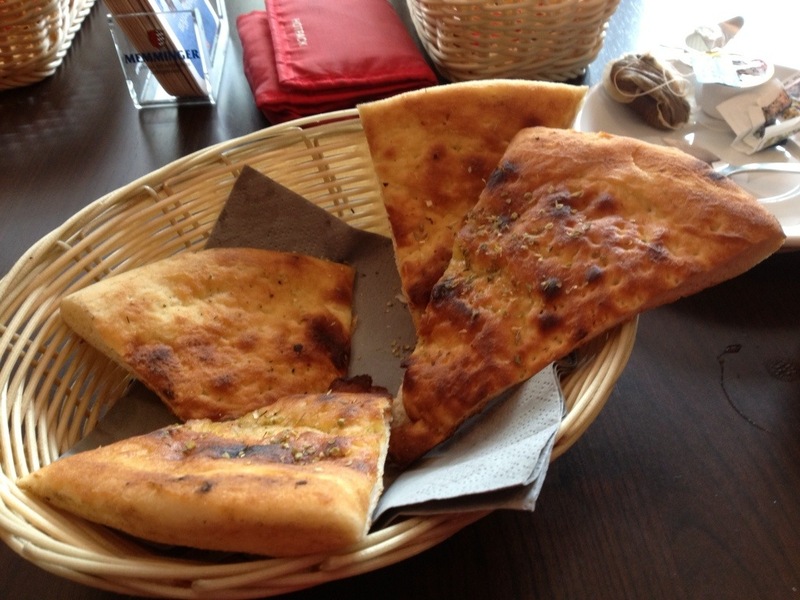 I dfidn’t want a full meal and they didn’t do soup (surprisingly) so I ordered a half Pizza Bread. 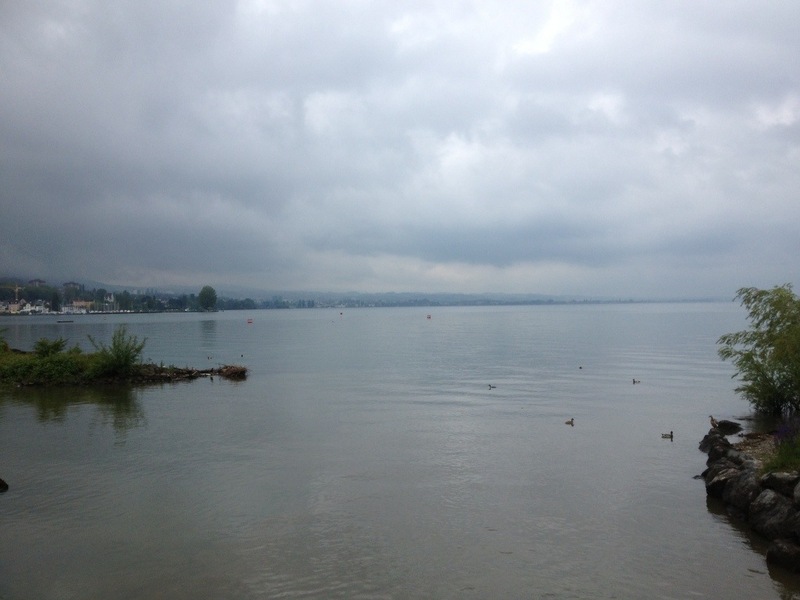 I headed off from Konstanz again with just 18 miles to go to Stein am Rhein. And now the rain came, properly set in and a bit colder. 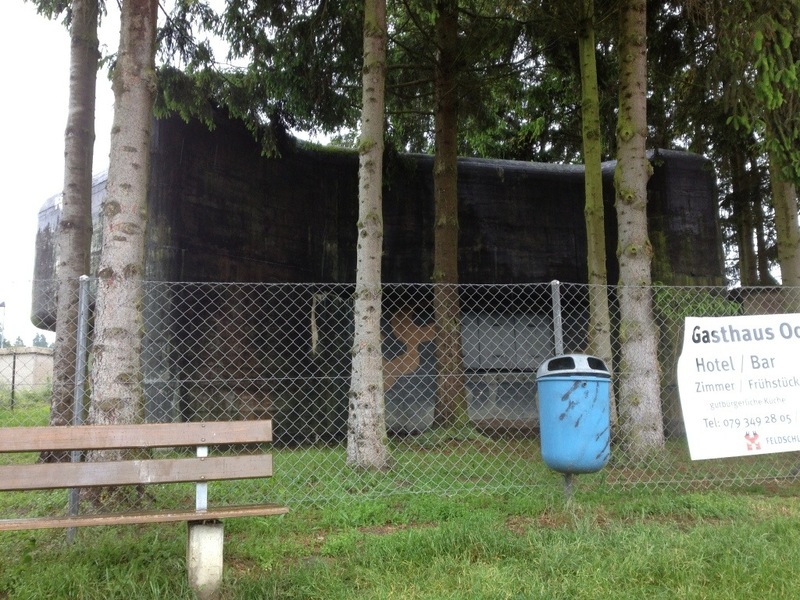 I passed this building in Triboltingen that looked like one of the WW2 hides you see all over England, but a bit larger. Something to do wtih Switzerland protecting itself from Germany in the war?? 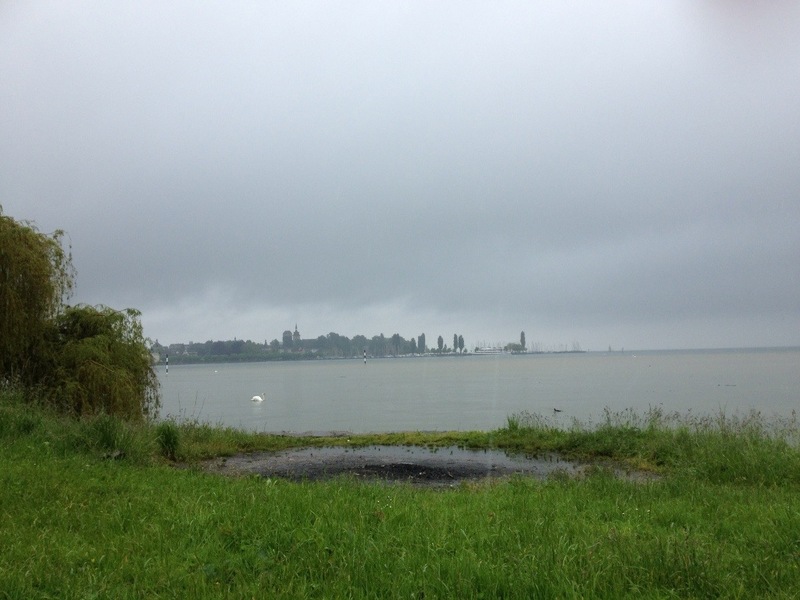 Bodensee squeezes itself through a narrow gap at Konstanz and then spreads out again into Untersee, which I was now cycling alongside. 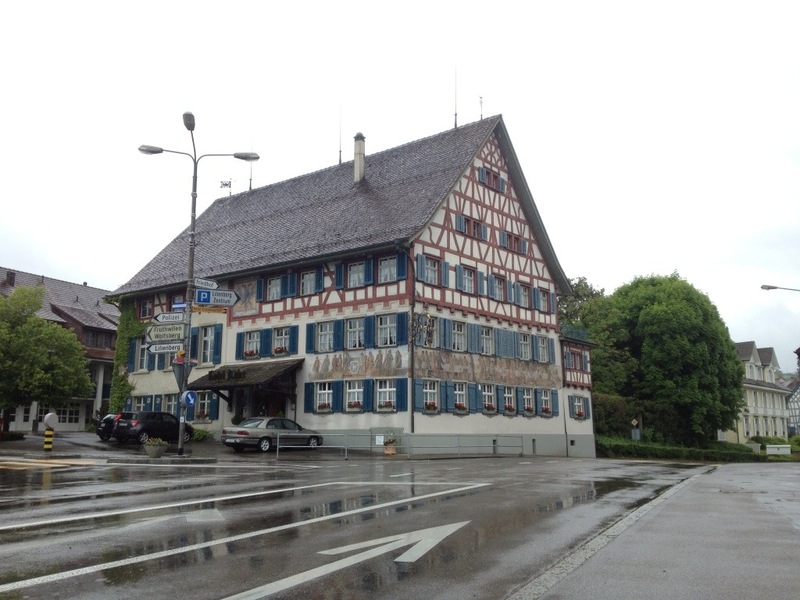 This beautifully-painted house was on the main road in Tribolltingen. Veg growing an scary clouds which continued to drop rain on me. 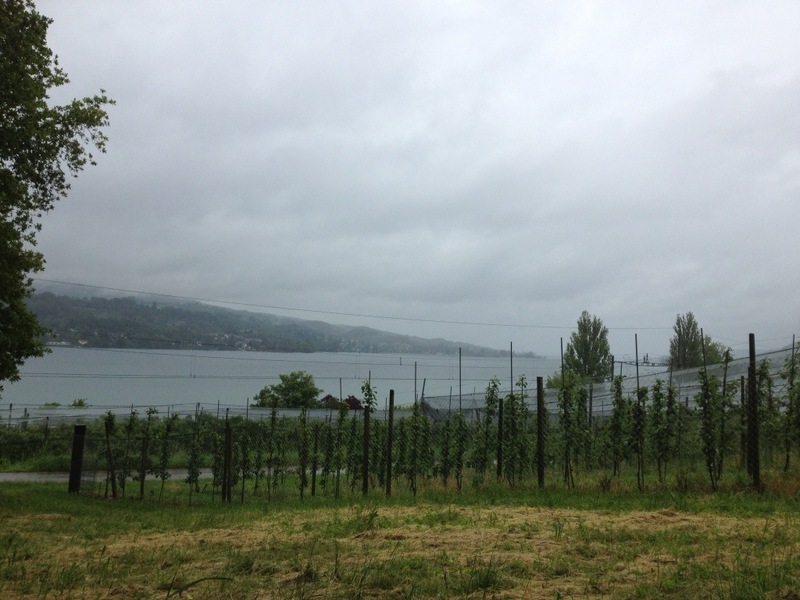 This is the view of Untersee from what my iPhone’s map wants to call Näächsthorn but I think that’s got to have an extra ä in it! 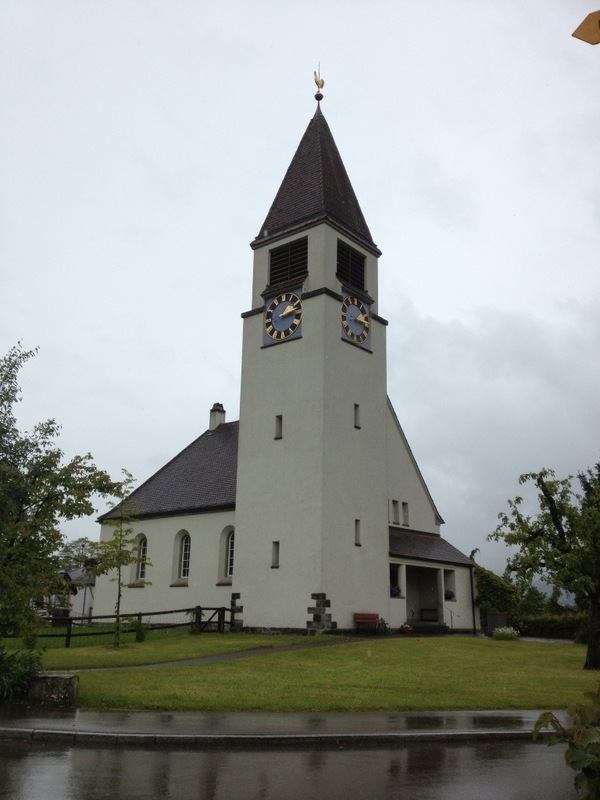 A very smart church I passed in Mammern. In Mammern I had to watch carefully as I cycled along the track because there were hundreds of snails wandering around. As far as I am aware I missed them all! 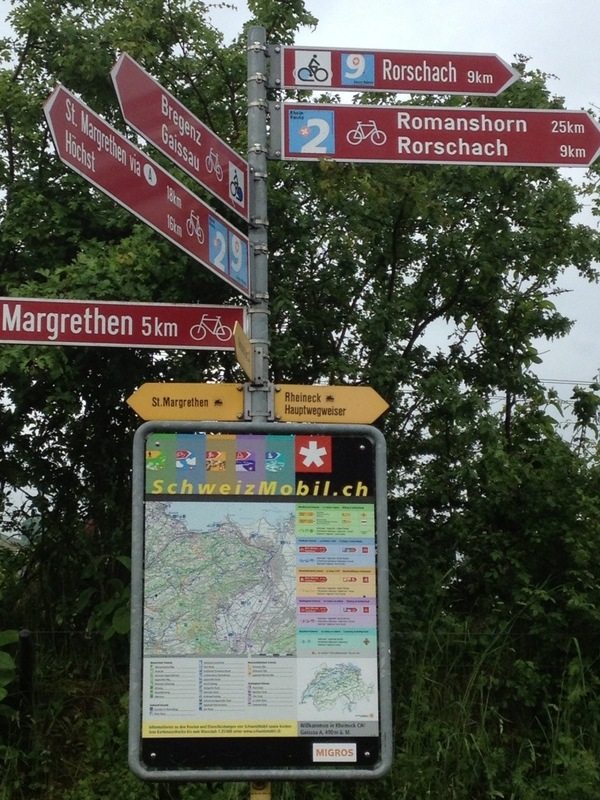 As the route neared Stein am Rhein it rather inconveniently started to climb. At Eschenz there was a particularly steep climb which was made harder by the wet tarmac with lots of leaves on it (not good for trike traction). I was also getting close to a group of three cyclists who were slower than me so I stopped a couple of times to take photos of the view to give them a chance to get ahead where the path was narrow. 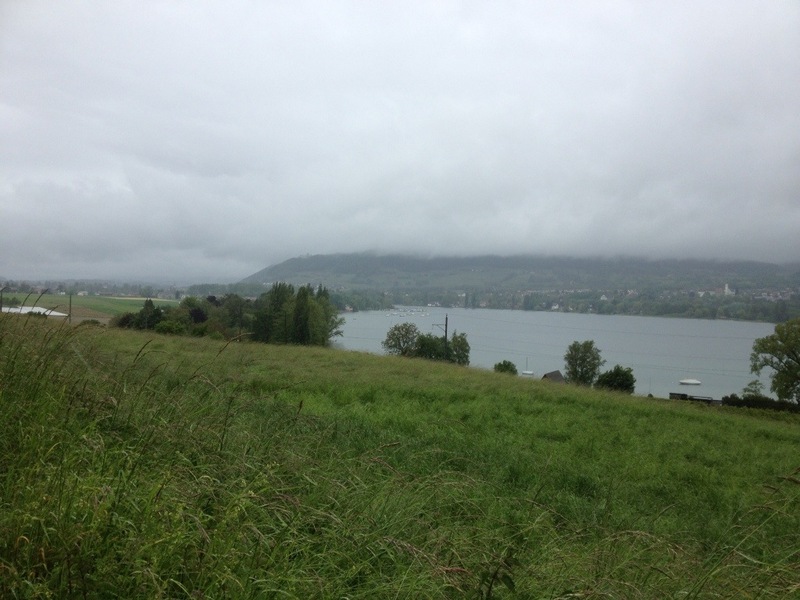 This photo is looking down on Stein am Rhein which is a very narrow pinch point on the Rhein (and I suppose could be considered the end of the Untersee and thus Bodensee itself). 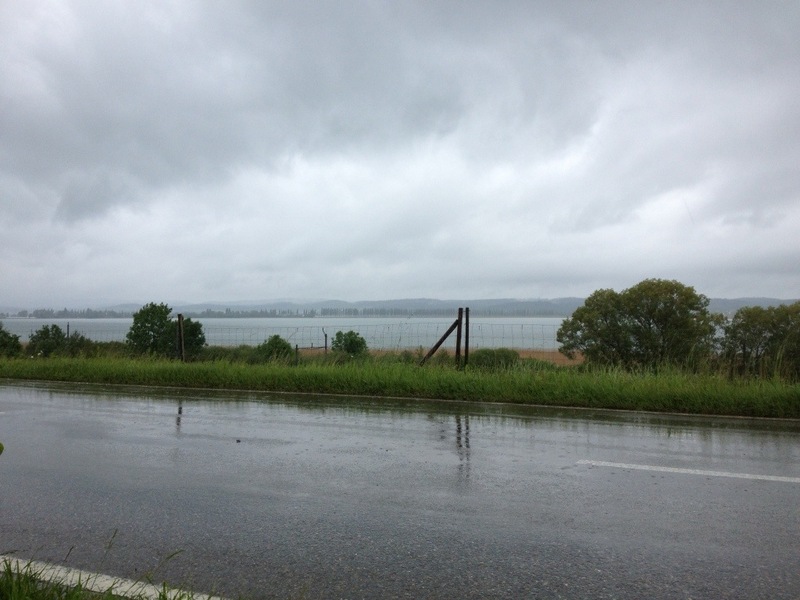 I said goodbye to Bodensee and its rain and looked forward to the improving weather forecast for next week. An uphill usually means there is a downhill and there was – a long, swoopy one. I was getting pretty cold now and was rather relieved that there were just two miles to go. I overhauled the three cyclists I had been trailing and then noticed a couple of warning signs in the middle of the path. Why were they there? I soon discovered they were marking a flood across the path. 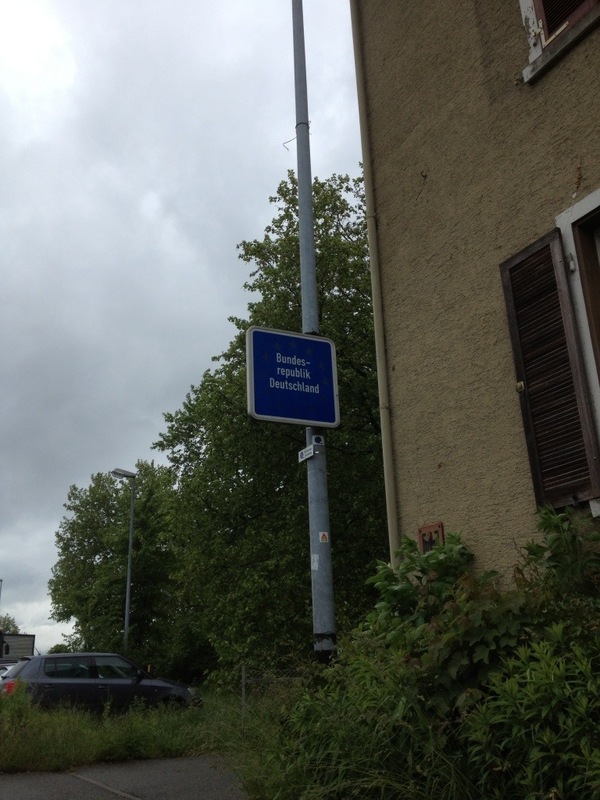 There was no alterntiave route so I had to go through. The level was above the bottom of my Banana Bags so I tried to hold them up out of the water with minimal success. The three cyclists were following me and talking very excitedly about the water although I doubt they got their feet wet (I didn’t). 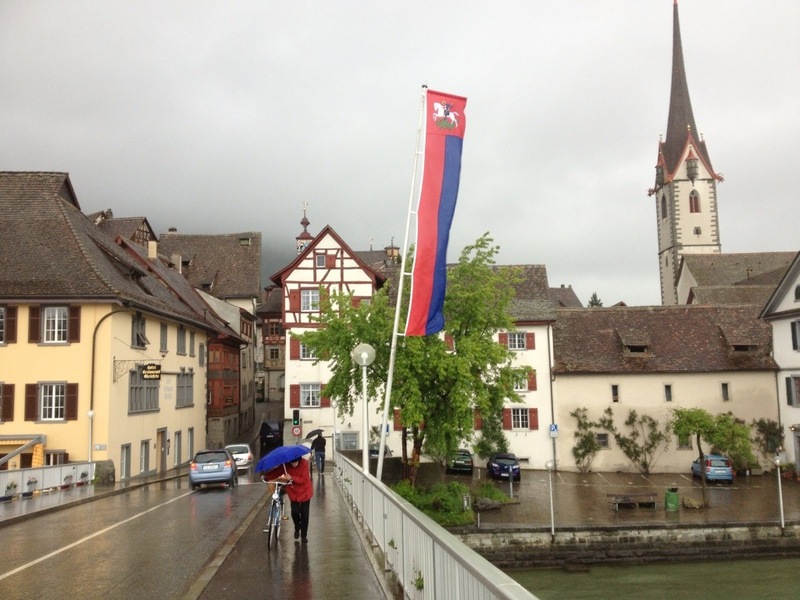 I arrived in Stein am Rhein, crossing the bridge with the rain beating down. The B&B I had booked was about three quarters of a mile outside the town and turned out to be, rather disappointingly, up a whacking great hill. 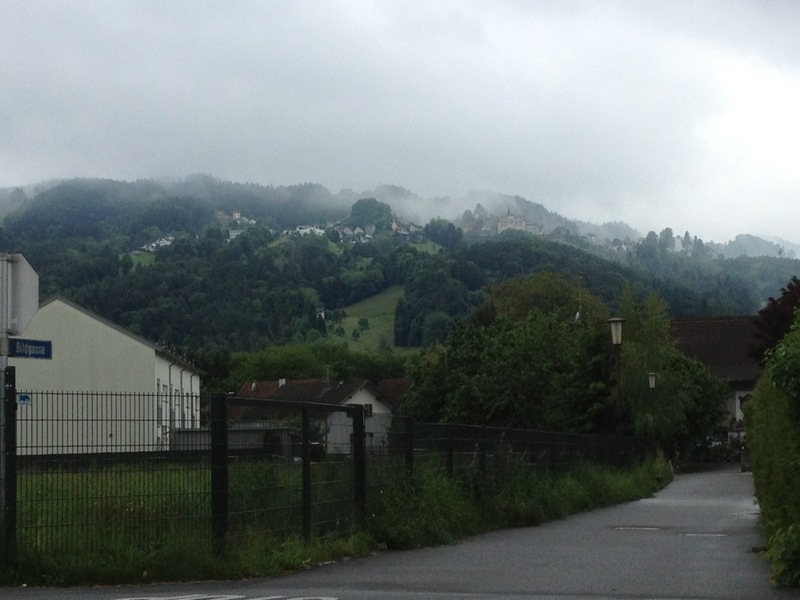 The sort of hill that I had to tackle in first gear (out of 33), at about 2mph. Not what you need after 50+ miles of riding. It took me a while to find the B&B that was nestled in a cluster of houses but eventually I located it, and the front door, and the doorbell – but there was no response! I tried several times, peered through the door, no luck. I noticed a business card pinned to the door with the mobile number of the B&B so rang it – and after ringing four times it went to voicemail. I left a message to say I was sitting outside, really cold, and wanted someone to let me in! After five minutes I tried again, still voicemail. This was not good as I was getting really chilly now. 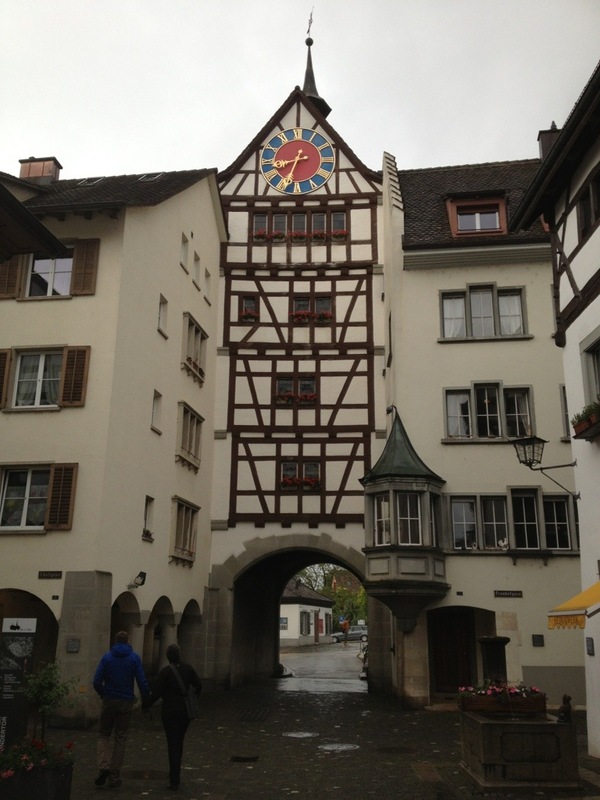 I got out my Bodensee Radweg book and looked up Stein am Rhein accommodation. There were eiight or so hotels listed so I checked where they were situated (I realised I wanted to be near the centre, not up a hill a mile away!) and phoned a couple. The first one I rang had a single room for 70 Francs including wifi and breakfast. That’ll do nicely! I left a message with the B&B to say that I had had to go elsewhere due to being really cold and headed down that steep hill (fun!) 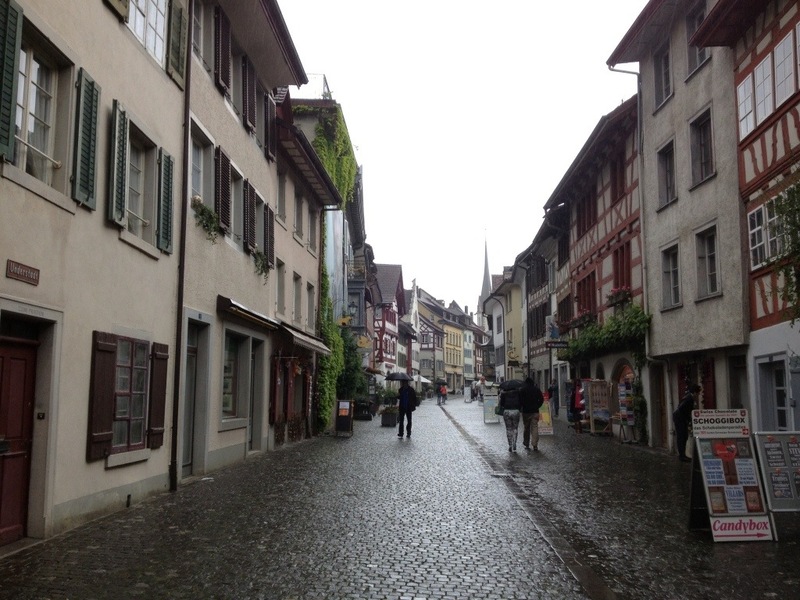 and back into the centre of Stein am Rhein. 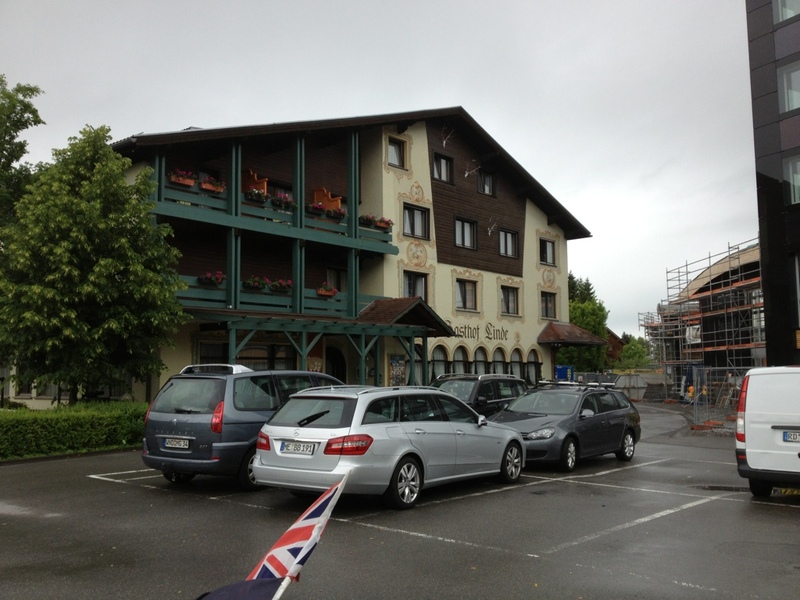 I found the Hotel Rheingerbe easily enough and the lady was very friendly. She showed my to my room which hadn’t been renovated in a while but was clean and looked comfortable enough. It took a while to get the wifi working which caused some panic on my behalf, not helped by me dscovering the Swiss use different sockets! Yikes, my iPhone charger didn’t fit in! I tried again later and it worked so panic number 2 was also now over. 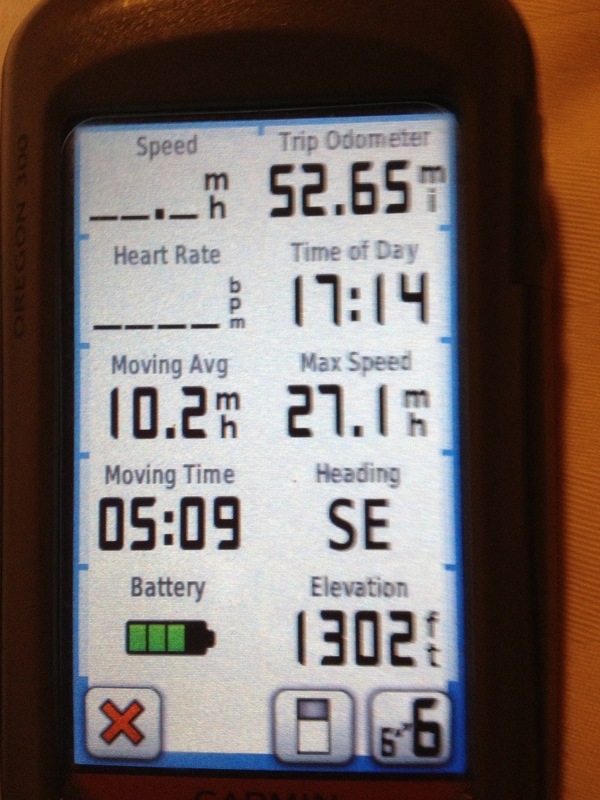 Here is the readout from my Garmin with today’s statistics – in imperial and then metric. I had a hot shower which was very welcome although I had a lot of stuff to dry and it didn’t all fit draped onto the radiator. I suspect I may have a bag of damp clothing in my panniers tomorrow. 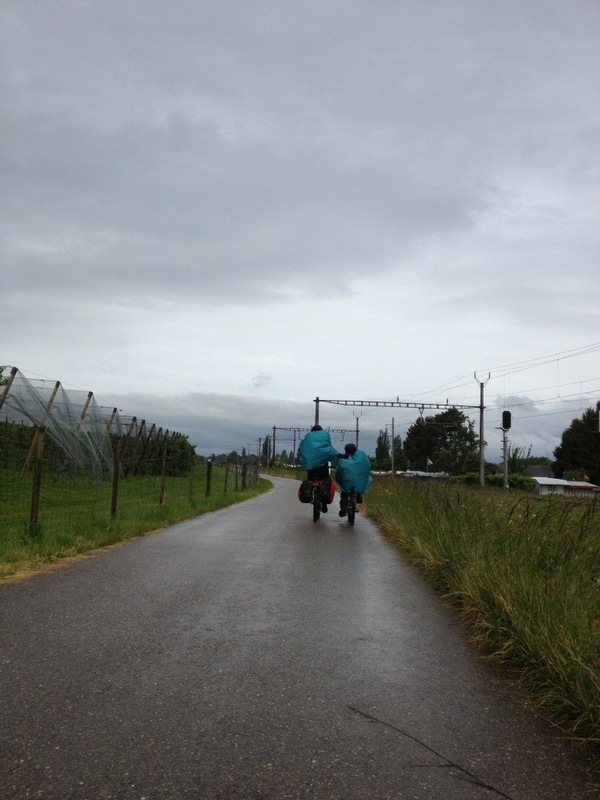 Talking of panniers, considering my banana bags were partially submerged in a flood they hadn’t let in much water at all, probably less than yesterday. Clearly driving rain for 10 miles is more of an issue than medium rain for 30 miles. 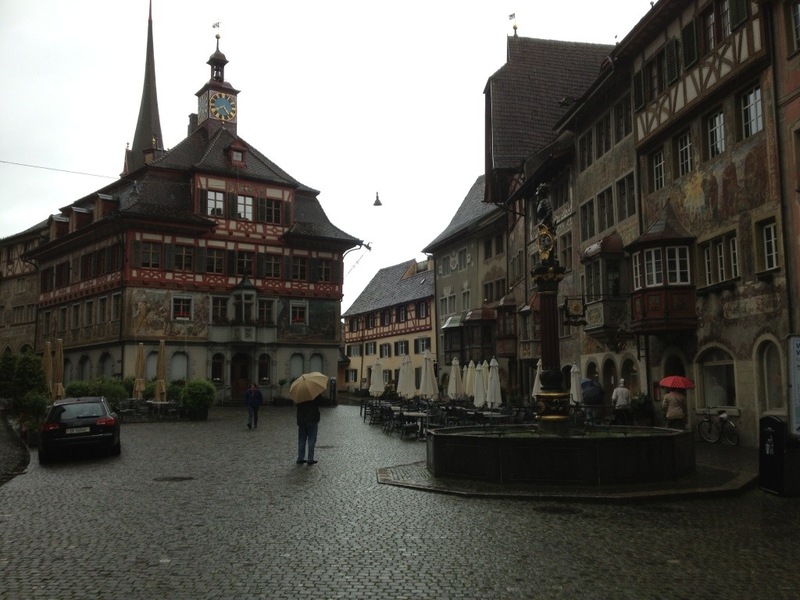 After my shower it was time to have a bit of a walk around Stein am Rhein. 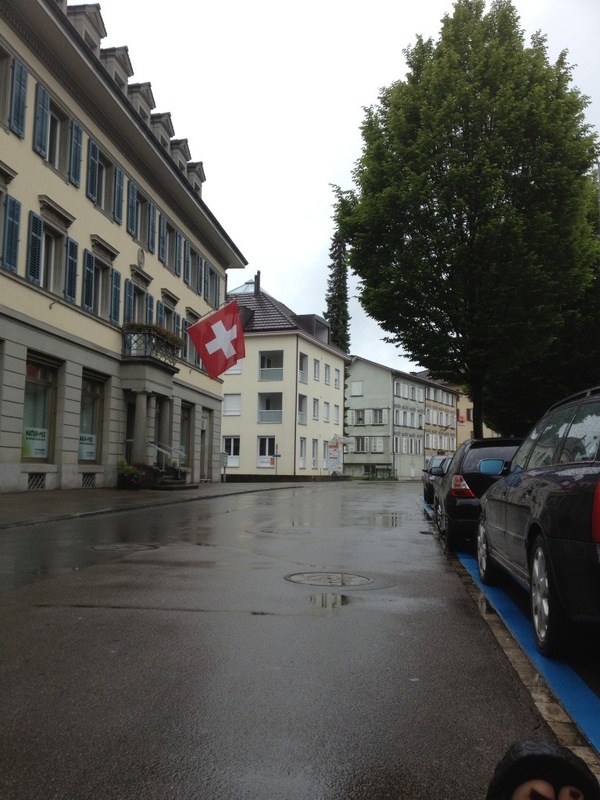 The hotel lent me an umbrella and I had a bit of a look around the pedestrian precinct which was just behind the hotel. 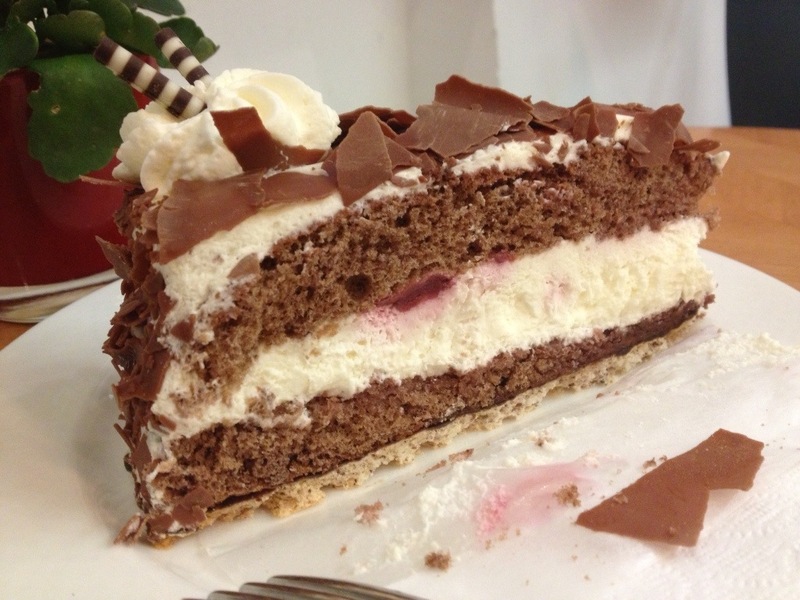 I was feeling peckish – not surprising after cycling for 52 miles and only having pizza bread for lunch – so I sstopped for a piece of black forest gateau! This was the choice I was initially faced with! 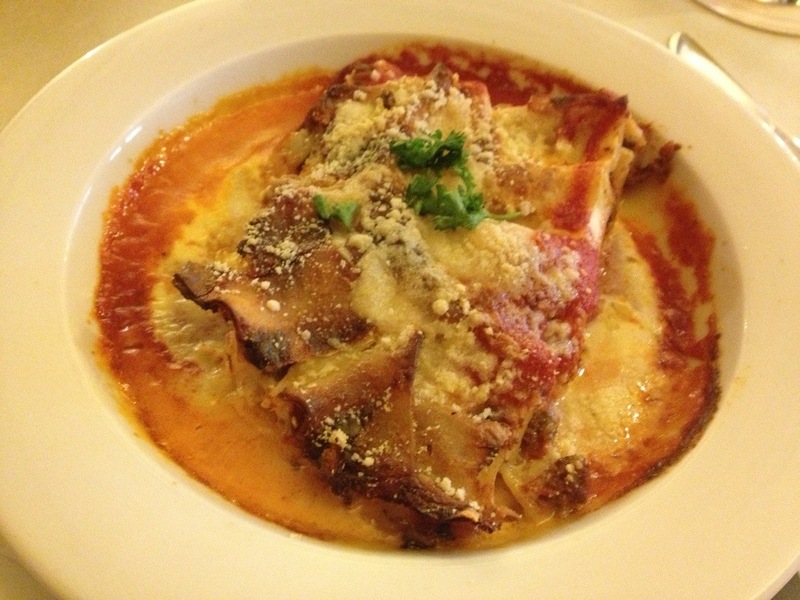 After writing up some of this blog it was time for dinner and I was very hungry! 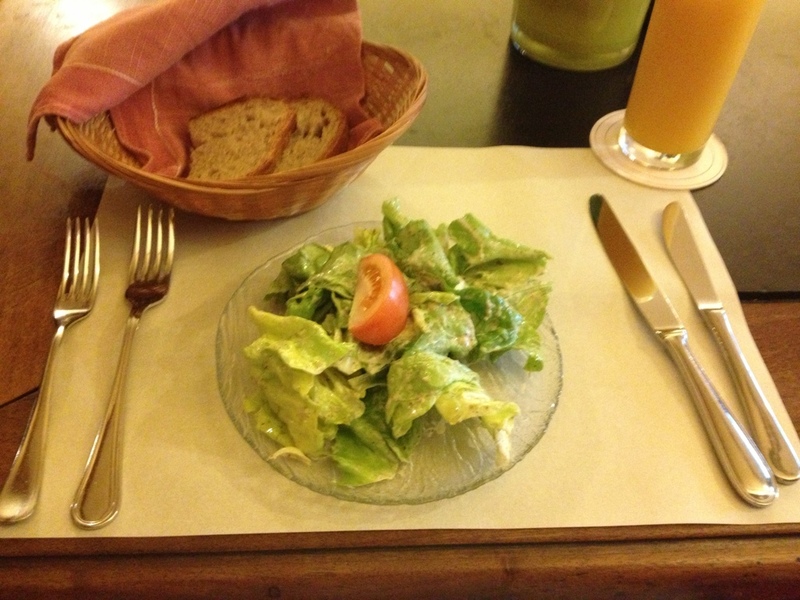 A local Stübl did an offer of salad and lasagne for 18 Francs. This seems remarkably expensive in gerneral but was cheap for Switzerland (I’d checked out lots of restaurants earlier). It was good food and the serving lady was friendly although the room was rather smoky as clearly smoking is allowed. It’s hard to remember what it was like in the UK before the ban but it seems so unpleasant now when people are smoking as you are eating. I could hear the people on the next table talking in English and talking about doing a cycle tour so when I’d finished I said hello and we got chatting. They were doing their first tour and a company was taking their luggage to the hotel each night so they weren’t touring with all their stuff. 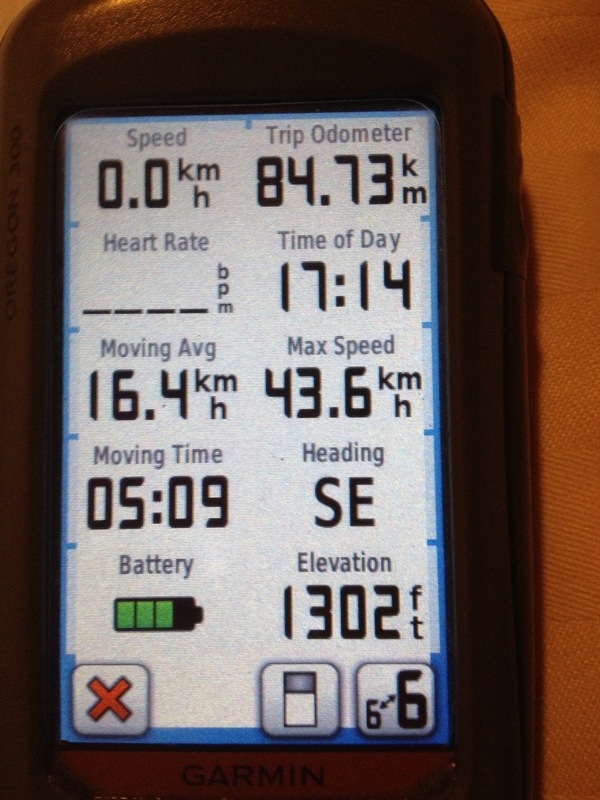 It sounds like they’re enjoying itr but they keep getting lost (no Garmin!) Tomorrow they are going to the Rhein Falls, as am I, so we might bump into each other. They say they saw a couple on recumbent trikes today. I walked back to the hotel and went up to my room but I still felt hungry so went downstairs to the restaurant and had an Apfelstrudel and tea. 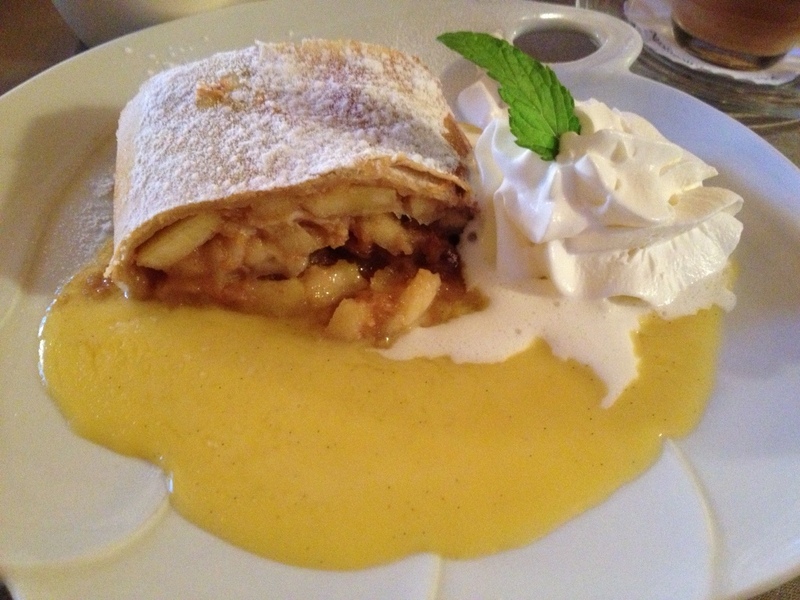 The Apfelstrudel was the cheapest thing on the menu at 8,50 Francs. A scoop of ice cream is 3 Francs (that’s £2), no wonder people say Switzerland is expensive. 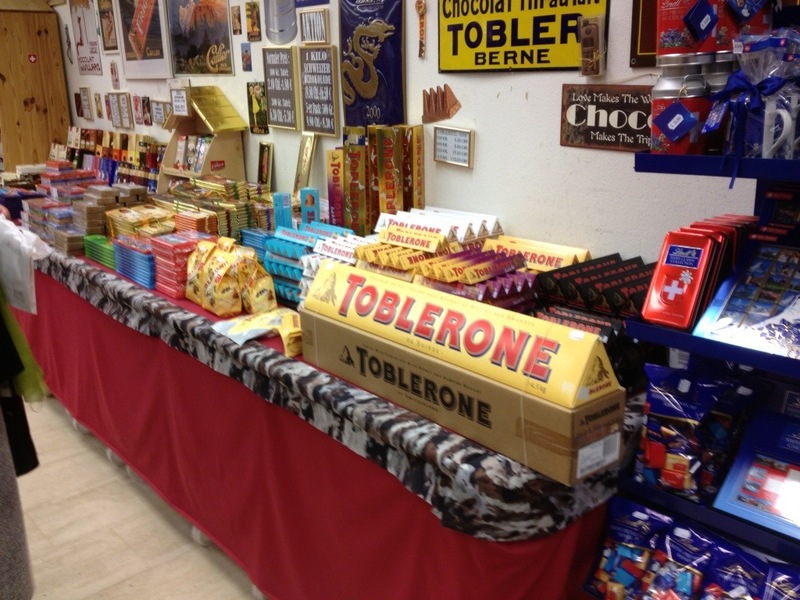 I will definitely try to overnight in Germany if possible. For example, my orange juice today was 6 Francs (that’s about £4) whereas one I had in Germany a couple of days ago was 2,40€. Still it’s been very cool to breakfast in Austria, cycle non-stop through Switzerland to have lunch in Germany and then have dinner in Switzerland. The awful weather is about finished now too so hopefully it will be sunshine from now on! Congratulations on keeping going in all that rain. 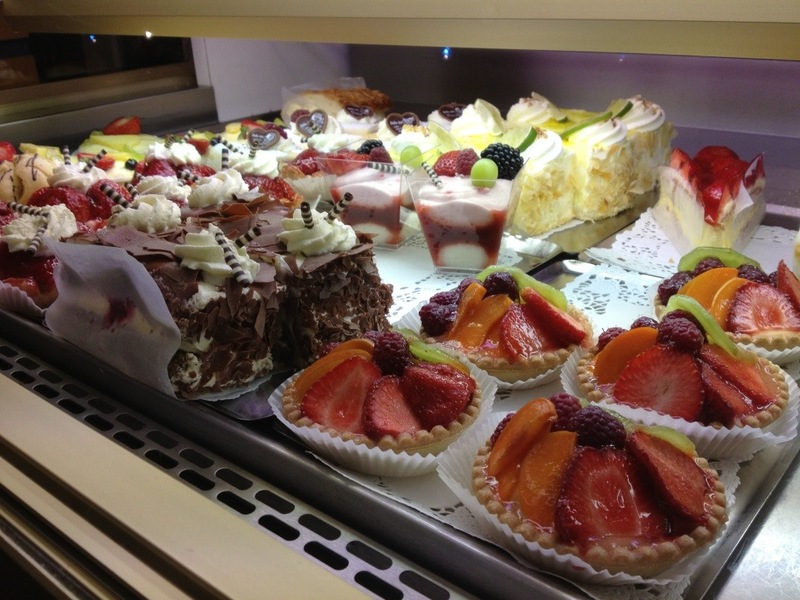 At least you found some nice cakes and some of the views must be stunning on a fine day. The combined sailing and cycling trip sounded a good idea.